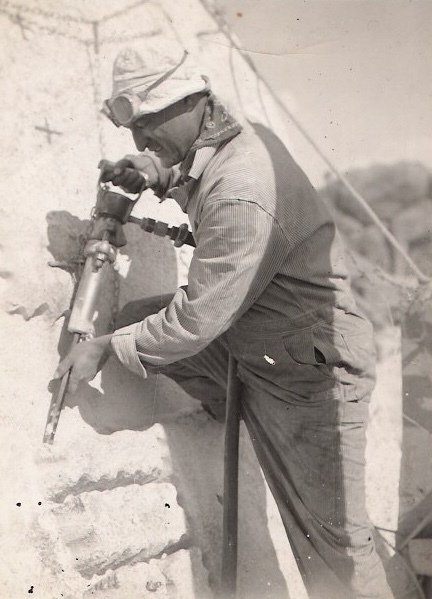 On Saturday September 16, 2017, the National Park Service will dedicate a long overdue plaque to Luigi Del Bianco, Chief Carver on the Mount Rushmore National Memorial. The plaque was designed by sculptor Michael Keropian. An unveiling ceremony will take place at the iconic memorial and will be open to the public. CBS SUNDAY MORNING will air a special segment on Sunday May 17. When the “Carving of Mount Rushmore”, by Rex Allan Smith, was published in 1985, Luigi’s son Caesar was shocked to find that his father wasn’t mentioned once. Luigi’s grandson Lou discovered on a trip to Mount Rushmore that his grandfather was just a name on a giant plaque listing all 400 “workers” equally, regardless of their role and contribution. Years of research by Caesar and Lou at the library of Congress unearthed a treasure trove of primary source documents proving once and for all Luigi’s vital and singular importance to the work.